Fall color is one of the great highlights of the year. Tourists come from around the world to see the colors of eastern North America, and almost everywhere, as the summer comes to an end, our gardens pulse with the brilliance of maples and oaks. In older, larger gardens, there is always room for a large shade tree, but in today’s modern, smaller gardens, such a tree will take up all the room, leaving no space for anything else. Luckily not all trees with vibrant fall colors are large – in fact, one group with a remarkable range of vibrant colors is small – the Japanese maples. These trees are already admired for the graceful shapes of their leaves, and their varied forms, from upright to cascading. Hundreds of different varieties exist, each one offering something unique – and all of them are small. Even the largest rarely reach more than 25 feet in old age, and most are perhaps 6 to 10 feet tall – small enough for even a terrace, and certainly easily grown in a small garden. Even if you only garden in pots, with their fine root systems they will live for years and years in a container. Almost all Japanese maples have vibrant fall coloring – the Japanese consider it to the highlight of the year. Colors range from lush, buttery golds, through sharp yellows, and on into myriad shades of orange, powerful reds, and rich scarlets and crimsons. Even the popular ‘red-leaf’ forms, with rich red leaves from spring to fall, usually take on brilliant much brighter red colors when the cool nights arrive. If you relish the idea of having a fall center-piece in your garden, but don’t have the space for a sugar maple or a red oak, then plant a Japanese maple instead. Let’s look at some that are particularly notable for this feature. They all also have several other valuable features that make them great choices for your garden. This tree is one of the larger Japanese maples. It can in time reach 25 feet, and it is relatively fast-growing too. With pruning it can easily be kept smaller, so in any medium-sized garden there is a place for this beauty. It does not have the red summer leaves so many people associate with these trees, but its graceful, hand-like leaves are a lovely green, having started in spring as a soft lime-green with delicate red edges inscribed around each lobe. It quickly grows into a graceful, upright small tree that will grace any smaller garden, or nestle in the shelter of larger trees. But it is in fall that the show really begins. The whole tree turns into a glowing ball of brilliant yellow – standing out in the crystal-clear light of the fall sunshine. This dramatic beacon will light up any space – and as the leaves begin to fall they carpet the ground beneath in gold too – so beautiful you will hesitate to get out the rake. However, for the Coral Bark Maple, known by its Japanese name of ‘Sango-kaku’, the show is really just starting. Because as the leaves fall, the bark of the stems is revealed – which in winter takes on the rich red of coral jewelry and gives this tree its common name. All winter it bright-red stems will stand out, especially when the sun strikes it – making this a truly ‘year-round’ tree. Quite different from the Coral Bark Maple, this tree is closer to the image many people have of Japanese maples. Reaching 6 feet in height, and perhaps eventually 10 feet, and at least as much across, this mound of cascading branches is clothed in the classic narrow, deeply-dissected leaves that are so admired by lovers of these trees. All summer long they are rich red – in fact this tree is perhaps the most reliable red-leaf form for keeping its color all summer. In fall, though, these leaves transform into glowing shades of scarlet and orange, making a fire-ball in your garden. For a smaller Japanese maple, this one takes some beating. With a name almost as long as the tree is tall, this Japanese maple is THE choice for those who love bonsai trees, but are put off by the work and skill involved. One of the smallest-growing trees available, this is a natural miniature, never growing above 3 feet tall, and so perfect for a container, where its charm and beauty can be appreciated to the full. The leaves are unusually long and elegant, with narrow, finger-like lobes spreading outwards. They grow naturally in tufts, so even the smallest tree has a mature look, which is why it makes the perfect ‘natural bonsai’. 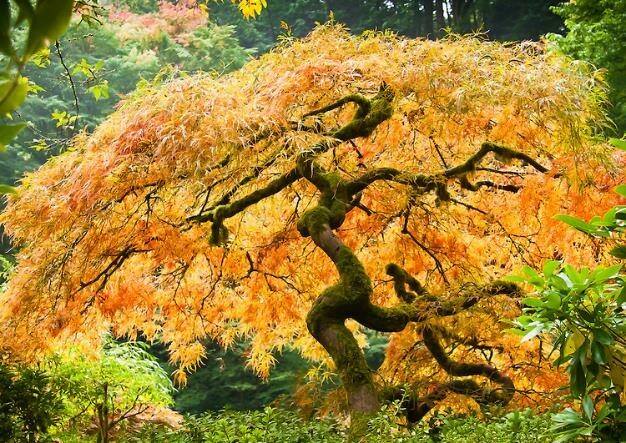 The leaves are bright green, and in fall they turn dramatic shades of yellow and orange, bringing joy and beauty to any garden lucky enough to have this rare and beautiful tree growing in it. This rare variety is a real stand-out. For a small garden it is the perfect choice, since it reaches only 6 to 10 feet, yet it has the look of a full-sized, elegant tree. The unique foliage has long, thin lobes, resembling the leaves of bamboo, and in fall it literally burst into flame, glowing yellow, gold and orange in the most spectacular display, and one that easily rivals the sugar maple. It has the added bonus of bright-crimson spring foliage, which turns apple-green for the summer. This tree is certainly something very special, and it is rarely available, so snap it up when you find one! No matter what variety of Japanese maple you grow, to develop the best fall colors they need some direct sunlight. One great advantage of growing your tree in a container is that you can move it around to optimize its light exposure. In spring you can place it in lots of sun, to develop strong growth. Then in summer, move it into a shadier spot, beneath the shade of larger deciduous trees. Some morning sun is always welcome, but shade from the hot noon and afternoon sun will protect the leaves from scorching. In fall morning sun is needed to develop color, and all-day sun from mid-September on will give you the most vibrant colors possible. A steady routine of watering and light fertilizing will keep you tree at its best, whether you have it in a container, or growing in the ground. Mulch over the roots of a tree in the garden will not only conserve moisture, but add nutrients too, and some regular liquid fertilizer will optimize the growth rate. Despite their delicate appearance, these trees are almost always free of pests or diseases, and are in fact easy to grow, as long as you pay attention to the simple job of watering, and grow your tree in an appropriate level of shade.